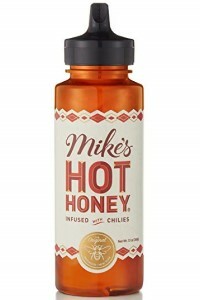 Mike's Hot Honey is a chili pepper-infused honey in a handy squeeze bottle. Michael Kurtz, the founder of Mike's Hot Honey was introduced to the idea of making honey hot in Brazil, in 2003. Back in the US, Mike started to create his own hot honey and perfected this recipe into what is currently known as Mike's Hot Honey. The product is made with wildflower honey harvested from hives in New York and New Jersey with added chilies and vinegar. This flavor combination made the honey popular with pizza lovers, but the use is so much wider; try it in your salad, with fruit and cheese, or part of a marinade for your favorite meat. How about a surprising topping on ice cream and Mike is even suggesting to using it in cocktails.